The last decade has seen the success of stochastic parameterizations in short-term, medium-range and seasonal ensembles: operational weather centers now routinely use stochastic parameterization schemes to better represent model inadequacy and improve the quantification of forecast uncertainty. Developed initially for numerical weather prediction, the inclusion of stochastic parameterizations not only provides more skillful estimates of uncertainty, but it is also extremely promising for reducing longstanding climate biases and is relevant for determining the climate response to forcings such as e.g., an increase of CO2. 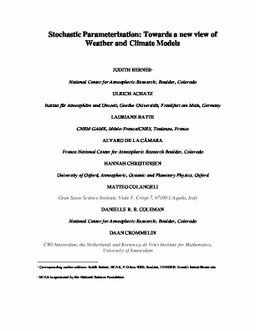 This article highlights recent developments from different research groups which show that the stochastic representation of unresolved processes in the atmosphere, oceans, land surface and cryosphere of comprehensive weather and climate models (a) gives rise to more reliable probabilist ic forecasts of weather and climate and (b) reduces systematic model bias. We make a case that the use of mathematically stringent methods for derivation of stochastic dynamic equations will lead to substantial improvements in our ability to accurately simulate weather and climate at all scales. Recent work in mathematics, statistical mechanics and turbulence is reviewed, its relevance for the climate problem demonstrated, and future research directions outlined.